Home Article Lebanese-British Barrister Amal Clooney Has Two Children With Her Husband, George Clooney; What About Her Past Affairs? 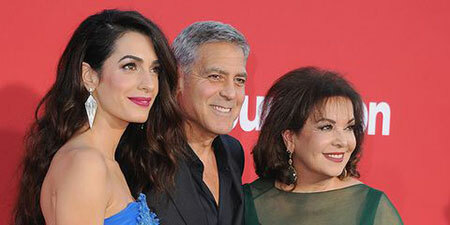 Lebanese-British Barrister Amal Clooney Has Two Children With Her Husband, George Clooney; What About Her Past Affairs? Ever since Amal Alamuddin tied the knot with George Clooney, the duo frequently appeared in the spotlight due to their realistic romance. Actually, Amal and George's chemistry is no less than a fairy tale. When George made the decision asking Amal to marry him, they were on a safari adventure together. Also, it's known that she and George fell in love via e-mail. Let's see what else we can find about the romantic relationship between Amal Clooney and George Clooney! The Lebanese-British Barrister Amal Alamuddin is one of the happiest women in the world, as she tied the knot with an iconic Hollywood figure George Clooney. Amal and George Clooney at their wedding. After obtaining their marriage license on August 7, 2014, at the "Royal Borough of Kensington and Chelsea" in London, Aman and George walked down the aisle on September 27 at city hall in Venice. Prior to that, a robust ceremony was held two days earlier, with the help of George's friend and former mayor of Rome, Walter Veltroni. In the biggest day of their lives, the city traffic got blocked just to ensure they could enjoy their ceremony. At the nuptials of the Aman Canal Grande luxury resort, the duo wore a lovely wedding attire, including George's Giorgio Armani tuxedo. Well, the couple enjoyed a ride on the Grand Canal profoundly happy watching a few famous faces like Bill Murray, Cindy Crawford, and Rande Gerber, who had traveled to the wedding on a "taxi boat". Since then, the pair is counted as one of the most adoring couples as they hold hands tight where ever they go. 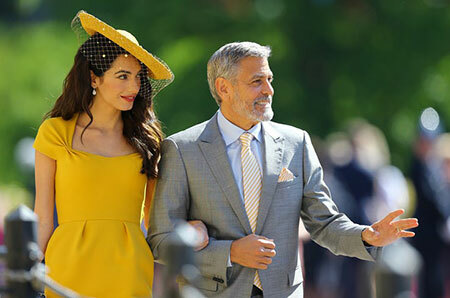 Amal Clooney and George Clooney attending the Royal wedding of Prince Harry and Meghan Markle in 2018. Moving back to the time, George, 57, after his marriage to actress Talia Balsam came to an end in 1993, he had sworn off wedded bliss and children long before he met and fell in love with international law specialist and human rights lawyer. The two passes 5 years of togetherness, and along the line the couple shared few secrets with the public about how they make their marriage work within the framework of their hectic schedules. The pair seems to enjoy like a fairy tale romance that surely left Clooney's fans both starry-eyed as well as heartbroken. Amal and George Clooney children. In the meantime, George gushed over his relationship with Amal, revealing that he's "never been happier in a relationship by any stretch of the imagination." Furthermore, he mentioned that Amal is "an amazing human being and she's caring. She also happens to be one of the smartest people he ever met. And she's got a great sense of humor. There's a number of reasons why." Well, taking a glance at their five years of the bond, the two has perfectly shaped their future, counting their blessed children; Alexander Clooney and Ella Clooney (twins born in 2017). Until then, we wish the lovely couple a blissful long life journey hoping for more positive news pretty soon! Back some time, in search of some juicy material, The Daily Mail published something peculiar about the pair saying that Amal's mother was no fan of George Clooney. Amal Clooney's mother hinders the romance of George Clooney and his wife. The article stated that Amal's mother Bariaa Miknass, who comes from a family of Sunni Muslims from Tripoli in Northern Lebanon, did not approve the pair's romance because of George's religion. For his part, George who became angry at the insinuation later slammed that the whole idea was absurd, saying that the article was "dangerous" for encouraging "xenophobia." The paper issued an apology, however, Clooney refused to accept it, saying that the paper was "the worst kind of tabloid. One that makes up facts to the detriment of its readers." Nonetheless, it was in July of 2014, long before the day Kellyanne Conway gave credence to "alternative facts." 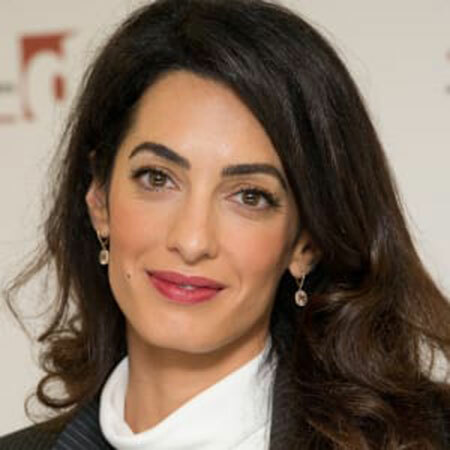 Amal Clooney was born on 3 February 1978, in Beirut, Lebanon. Clooney graduated from Dr Challoner's High School, and later attended St Hugh's College, Oxford. In 2000, Clooney graduated with a BA degree in Jurisprudence from St Hugh's College, Oxford. In 2001, she entered New York University School of Law to study for the LLM degree. Amal worked in the office of Sonia Sotomayor, then a judge for the United States Court of Appeals for the Second Circuit. As of 2019, Amal Clooney's estimated net worth is $10 million.